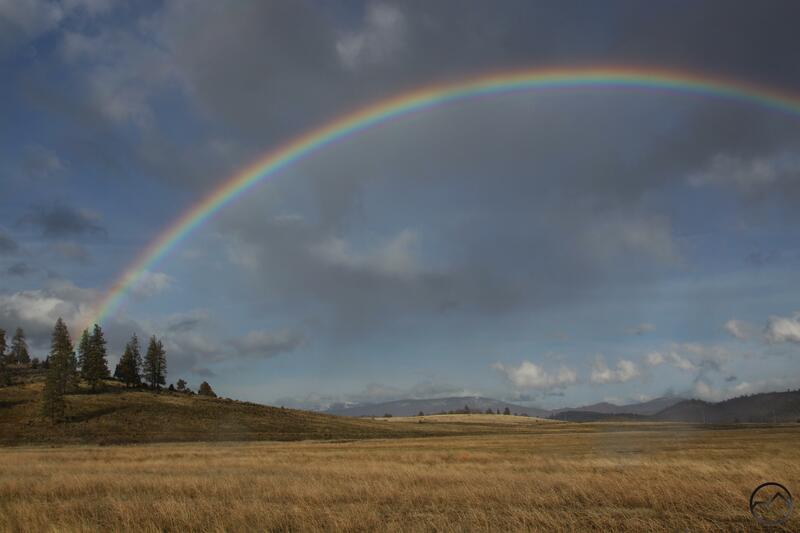 A rainbow arcs high above the Cascade Crest and the Shasta Valley. After observing the effects of the storm on the Sacramento River and its tributaries, a break in the weather presented the opportunity for a quick investigatory trip north to see how the snow and rain was impacting the Shasta River. The Sacramento River begins on the south flank of Mount Eddy, the highest point in the Trinity Divide, a subrange of the vast Klamath Mountains. The river continues south and is joined by many rivers of flowing out of the Cascades, Sierra Nevada and Coast Ranges before discharging into San Francisco Bay. The Shasta River begins on the northern slopes of Mount Eddy and flows through the Shasta Valley before contributing its waters to the mighty Klamath River. This river in turn continues west and gathers other large rivers to it before reaching the sea in a somewhat unheralded fashion south of Crescent City. Though the watersheds of these river systems begin just a few miles apart, their appearance is strikingly different. The Sacramento River flows south through dense forest and deep canyon. The Shasta River flows north, through semi-arid high desert and the wide open terrain of the Shasta Valley before plunging into the Shasta River Canyon and joining the Klamath River (read more about the Shasta River here). 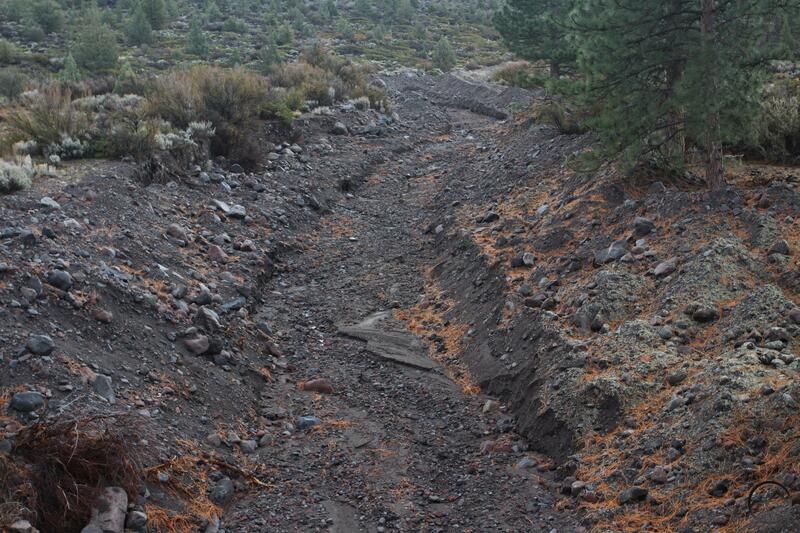 The reason for arid landscape is Mount Shasta’s large rainshadow. The mountain tends to attract storms and then wring the moisture out of them. Consequently, as storm systems move north they have much less water in them and precipitation is dramatically less. It was for this reason that while a storm raged around Mount Shasta, it was possible to head north and investigate the waterways of the Shasta Valley with blue skies. The winds were powerful and were whipping lots of water into the air, despite no rain actually falling. This made for some excellent rainbows. The two largest bodies of water to observe at the south end of the Shasta Valley are the Shasta River itself and Parks Creek. The latter forms on China Mountain, the fourth highest point in the Mount Shasta area. As I had anticipated, the water was high in both river and creek. 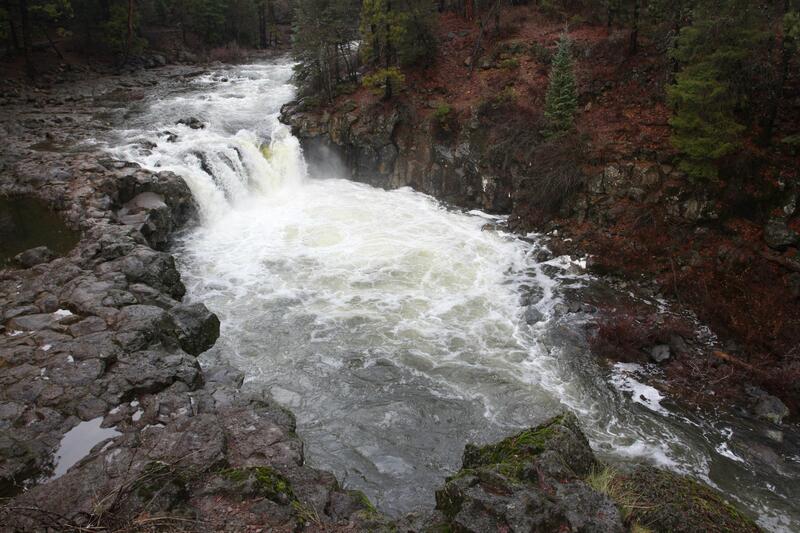 However, they were not the raging torrents that the Sacramento River and tributaries had been. This was to be expected considering their headwaters were along the periphery of the rainshadow. It was heartening to see the water level high. Thirsty Lake Shastina is getting a good infusion of much needed water. Hopefully, with the strong snow pack and even more precipitation through the coming months, the lake may even refill. Shasta Lake certainly had some relief as well. The lake has come up 35 feet since the beginning of January and will continue to do so for several months to come. It has a long way to go yet, but this coming summer want be as dire as the last couple have been. While observing the rivers, to the south a great wall of dark cloud roiled along the southern perimeter of the Shasta Valley. Black Butte was partially veiled behind a wall of rain but could still be discerned. 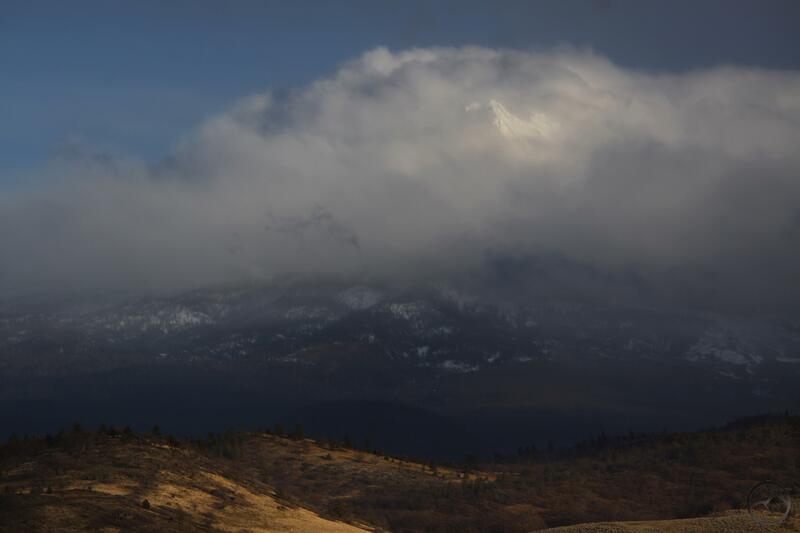 Mount Shasta was obscured by the swirling storm clouds. At times an opening in the clouds would emerge and some point of the mountain would peek through, reassuring me that it was still there and would weather this storm, just as it had many others. I felt thankful that it would, but also thankful that the storms have come. There is a mountain in there somewhere. The heavy rains of the last few days swelled the creeks and rivers all over Northern California and the Mount Shasta area was no different. I had gone out on December 11th to see everything in the midst of the storm and it was truly a sight to behold. Creeks that are normally small trickles were incredibly large and angry torrents. The rivers were enormous and awe-inspiring. Unfortunately, I for got my camera and did not document the fury of the storm-fed monsters. Setting out to rectify the omission from the day before, I packed up my kids and my camera and headed out in my jeep to see what the rivers looked like. The water had already subsided but everything was still incredibly full. After such a bad winter last year, it is gratifying to see so much water. After such a horrible drought, it has been a great way to start the winter.